Hier folgende CD / Here following CD One by one. Flora's secret. Shepherd moons. Carribean blue. Marble halls. Orinoco flow. Paint the sky with stars. Pirates - Feat. Enya.- You Should Really Know CD Single. CONDITION: JACKET: NM / OBI: NM / DISC: NM. Japan JEWEL CASE CD. CD NUMBER: 20P2-2725. Up for Grabs, Enya Anywhere Is UK CD Single. CD Few Marks Which Won’t Affect Play Generally Good. Anywhere Is. 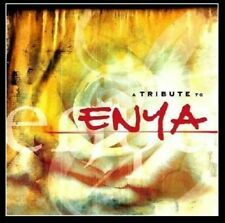 TRIBUTE TO ENYA CD NEW! Hier folgende CD / Here following CD One by one. Flora's secret. Shepherd moons. Carribean blue. Marble halls. Orinoco flow. CD cases and artwork are in very good condition, scan of actual CD is shown. Up for grabs, Enya Paint The Sky With Stars Best Of Greatest Hits CD – Like New. Paint The Sky With Stars. CD Like New. Caribbean Blue. Up for Consideration is a LIKE NEW COPY OF ENYA ~ PAINT THE SKY ~ 1997 CD. DISC: A little scratch, crack or slit on CD, Play perfect. MADE IN UK. Back Cover: Very Good. Cover/Booklet: Very Good. Paint the Sky with Stars: The Best of Enya by Enya CD - Good Cond. CD - Paint the Sky with Stars: The Best of Enya - Disc and media are in LIKE NEW Condition. Includes "Orinoco Flow", more - see pictures for the song list. UK pressed CD. Condition (inlay/disc): EX/EX (see below for definitions.). Normal wear and tear on the cover, without any major defects, is acceptable. Jewel Cases are not graded as they are replaceable. All cases may show limited signs of wear, but never cracked broken or chipped unless otherwise noted. Disc/ Artwork VG condition! Little to no surface scratches. CD IS EX - INLAY IS EX - CASE IS VG. Artist Enya. Urban Picker. Record Label Reprise. Release Year 1997. Modified Item No. Item is in very good condition and plays fine. Discs Are In Working Order, May Or May Not Include The Album Cover Art. In Good Condition. ENYA - PAINT THE SKY WITH STARS (THE BEST OF ENYA). GOOD - DISC HAS MINOR MARKS THAT DON'T AFFECT PLAY. HOW MY CD'S AND DVD'S ARE RATED. It all depends on which country you are purchasing from. GOOD CONDITION. The CD is pre-owned but in good condition.The Jewel Case has scuffs. The jewel case has minor scuffs as well as the CD but nothing damaging. Paint the Sky with Stars: The Best of Enya by Enya (CD, Nov-1997, Reprise) NEW! Paint The Sky With Stars, The Best Of Enya on CD. Artist: Enya. Format: CD. Condition: New. Sub Genre: Pop. Genre: Rock/Pop. Release Date: 1988-09-19. PAINT THE SKY WITH STARS. This CD is new, factory sealed, unplayed, original. CARIBBEAN BLUE. We are here for you! We always answer them within 24 hours. We will resolve any issue as soon as possible. Interpret Enya. Format Album. Edition Best Of. IN OVERALL VG CONDITION. SOLD AS IS! And If the parcel do missing or It's late. of the commodity since the short one week. can use our for the commodity sending out into Japan. RELEASE COUNTRY JAPAN. Label /Comapny WEA / WARNER MUSIC JAPAN. Label: Reprise / Wea. Paint the Sky with Stars. Original Release Date: 1997. Caribbean Blue. Disc is in almost perfect condition. Number of discs: 1. Marble Halls. Only If. Title: Amarantine. Artist: Enya. Format: CD. Condition: New. Sub Genre: Pop. Genre: Rock/Pop. Release Date: 2005-11-21. RARE EU RELEASE. SINGAPORE, TAIWAN, HONG KONG, MALAYSIA. POLAND,SWITZERLAND, UK, IRELAND,USA, CANADA, OZ, NZ, JAPAN, KOREA. SPAIN, PORTUGAL, ITALY, HUNGARY, SLOVAKIA, CROATIA, SLOVENIA, GREECE. NORDIC COUNTRIES, BENELUX,FRANCE, GERMANY, AUSTRIA, CZECH REP.. Paint the Sky with Stars: The Best of Enya. Title : Paint the Sky with Stars: The Best of Enya. Artist : Enya. Binding : Audio CD. Product Category : Music. Condition : Very Good. Release Date : 2002-07-31.